You are going to Watch Cardcaptor Sakura Episode 51 English dubbed online free episodes with HQ / high quality. Stream Anime Cardcaptor Sakura Episode 51 Online English dub Sakura and the Big Teddy Bear, Several people at school have started making their own teddy bears to give to their loved ones, while Eriol helps Sakura make her bear for Yukito, secretly enchanting one of its ears. 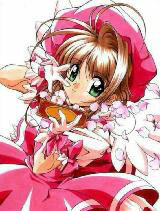 Syaoran, who also has feelings for Yukito and has made his own bear, begins falling in love with Sakura as well. Yue approaches the confused Syaoran and tells him that the reason he seems to be in love with Yukito is that he, having descended from Clow Reed, is really reacting to the immense magical power stored inside him, since Clow Reed and Yue were intimate at one point. That night, Sakura gives Yukito the bear, only to see it grow in size in response to Eriol’s magic. Yue awakens to protect Sakura from the bear but quickly loses his power. Sensing the bear’s power source in its ear, Sakura transforms the Jump and Fly cards, the latter granting her a new winged form that allows her to use Sword as well (since both cards previously involved Sakura’s wand transforming and couldn’t be used simultaneously as Clow Cards), cutting off the bear’s ear and returning it to normal.